The 2014 International Archaeology Day theme was “The Archaeology of Work: 9 to 5 in the Ancient World”. The event took place Saturday, October 18th, 2014 at Sabin Hall from 1:00-4:00 pm. In honor of International Archaeology Day, local archaeologists from UWM, Marquette University, and elsewhere engaged visitors with interactive presentations of ancient “jobs” from around the world. Visitors also had a chance to check out the “work” of archaeologists today and appreciate how it helps us gain an understanding of ancient civilizations. The 2014 International Archaeology Day event drew an older crowd than we’ve seen in years past, and this provided our chapter with an opportunity to highlight the role of local universities and their resources, especially through our ‘Work of Archaeologists’ presentations and tour of the Archaeological Research Laboratory at UW-Milwaukee. Local high-school students (and parents) utilized this event as an unofficial ‘career day’, while friends of archaeology continued to support us with passion and endless curiosity. Thanks to this year’s theme, many of our presenters were able to engage with experimental archaeology, producing stone tools, bellows, pinch pots, and even Neanderthal ochre palettes. Once again, this event brought together students, professionals and the community alike by learning and producing knowledge together. We’d like to thank our 50 visitors and 15 presenters/volunteers for a successful and fun event! 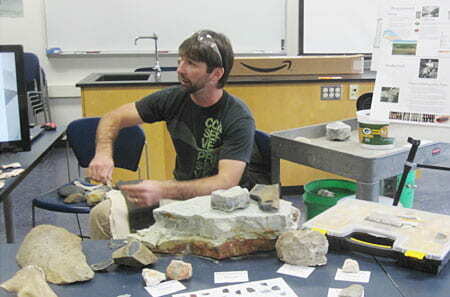 Rob Alrichs (UW-Milwaukee, PhD candidate) demonstrates knapping technique at his lithics workshop. 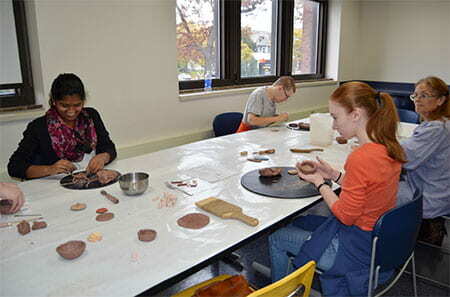 IAD participants hard at work at the Iron Age ceramic production and decoration activity.